Stems solitary or clustered, short, subterranean or erect, to 50 cm long and 2-5 cm in diameter, rough-ringed. Leaf blade 40-120 cm long, with 3-16 falcate pinnae on each side, these dark green, slightly leathery; ribs prominently elevated above, forming an angle of 45-70° with the rachis; unfolding leaves light green. Fruit acute, green or rose to bluish black. Flowers in Dec-Feb.
Two forms of this variety occur in Ecuador, sometimes together, in which case they appear to be quite distinct: a small form with short petiole, and leaf blade 40-70 cm long with 3-10 broad pinnae on each side; and a larger form with long petiole, leaf blade 80-120 cm long, and up to 16 narrow pinnae on each side. 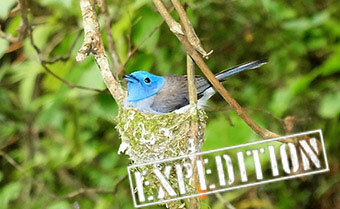 In Ecuador it occurs mostly in the N and in wet premontane forest further S along the Andes. Forming large colonies confined to the banks of small, fast-flowing rivers, sometimes growing partly submerged. One of only a few palms in the world that grows in water. Sea-level to 300 m elevation. 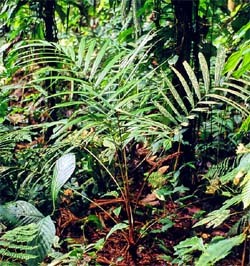 Geonoma cuneata subsp. linearis Superposición de imágenes ©2019 Trebrown - No no autorizada re-distribución.